When you’re short on time, you can’t afford to spend leisurely hours perfecting each yoga pose. These 10 poses will give you maximum benefit in minimum time, and the best part is -- they can be practiced anywhere and everywhere! Try these poses out whenever you need a little yoga pick-me-up. This heat building pose stretches and strengthens the lower body and also helps tone the pelvic floor and core muscles. 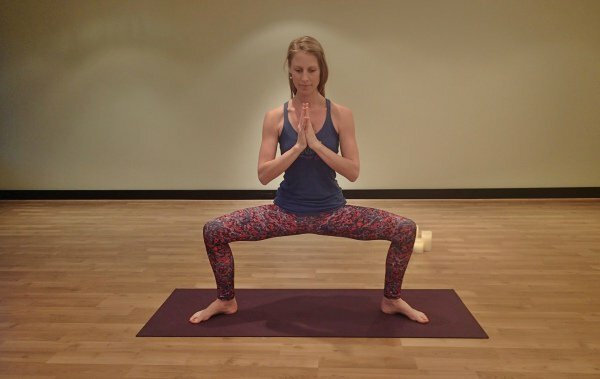 To move into a Goddess Squat, take the feet wide and turn the toes out. Draw the pelvic floor and core muscles in as you bend at the knees and take a seat. Draw the tailbone down and lengthen the spine. You may like to bring the hands to prayer at the heart, to the thighs for support, or take them towards the sky. This beautiful hip opening pose is a great way to release stored emotions, as well as counteracting the tension created in the hips by sitting in chairs all day. From a tabletop position, bring the right knee behind the right wrist and tuck the ankle in towards the groin. Stretch the left leg out behind you and use a block or bolster to support the hips if you need. Inhale and stretch the spine long and as you exhale, and allow the torso to fold forward onto the forearms, or rest the chest on the floor. This strong backbend stretches the entire front of the body while also strengthening the muscles of the back. This pose (and standing modifications) can be done throughout your day to relieve aching back muscles from hunching over an office desk. From a high kneel, bring the hands onto the lower back, gently lift through the heart, and lean back. If it feels comfortable for the neck and shoulders you may take the gaze up and then behind you. If the lower back feels strong in this position, you can advance to placing the hands onto the heels to increase the benefits of this pose. This powerhouse of a pose is virtually all you need to build a strong core and upper body. You don’t even need to move to reap the benefits -- simply find the breath in this pose and work at holding it for as long as you can. in a strong line. Press the hands into the floor and engage the core muscles to straighten the back. Plank Pose can be practiced from the knees or the feet depending on your strength. Taking the time to twist out the spine has numerous benefits. It massages the abdominal organs aiding in digestion, as well as helping to keep the spine healthy by releasing tension that builds between the vertebrae. Sit with one leg outstretched and the other bent at the knee with the foot on the floor. Inhale to lengthen the spine, and twist towards the thigh, compressing the belly against it as you do. Allow one hand to rest behind you as you press the other elbow into the thigh to increase the stretch. If the neck allows, turn the gaze towards the back shoulder. Warrior II is an iconic yoga pose, and for good reason. It builds intense heat and strength in the legs, and is easily modified to suit every body. Take the legs wide, and turn the front foot towards the front of the mat. The back foot finds 45 degrees as you bend deeply into the front knee. Keep pressing the outer edge of the back foot into the mat and take the arms to shoulder height. Gaze out over the front hand and engage the core and pelvic floor for maximum benefit. Many of our back aches in modern life are due to an intensely tight lower body, and a Seated Forward Fold is the perfect cure. Sit tall on the sit bones with both legs out in front of you. Inhale and extend the arms towards the sky. Exhale and fold from the hips, keeping the chest lifted to protect the spine. You may like to practice this pose with a block or cushion under your tailbone if your hamstrings are extremely tight. The perfect pose to work on your balance while also strengthening the calves and ankles. 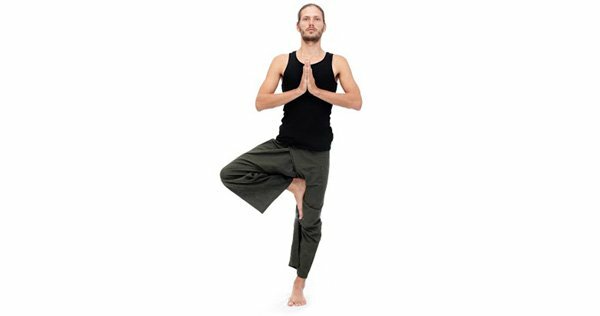 This pose can be practiced while brushing your teeth, waiting in line, or whenever else you have a few minutes to spare. Bring the weight into one foot, and lift the sole of the other to either the ankle, below the knee, or to the thigh. Press down in the standing leg, activating the muscles in a long line from foot to top of the head. Bring the hands in front of the heart or above the head. This core building pose will create a fire in your mid-section to help build a strong foundation for other, more advanced poses. Sit evenly on the buttocks with the soles of the feet flat on the floor. Inhale and lift the calves parallel to the floor. The hands can either press into the floor behind you, hold onto the thighs, or extend towards the feet. As your strength increases, you can extend the legs out straight and lower the body closer to the ground. Corpse Pose is the perfect conclusion to a strong yoga practice (or a long day). Find this pose for a few deep breaths to help you to recharge your energy and release tensions stored in the body. Lie on the back and close the eyes. Let the body gently release into the floor with the palms facing up and the toes resting out. Breathe deeply into the belly, the side ribs, and all the way to the top of the chest until the lungs are completely full. Hold the breath for a moment before slowly exhaling all of the air from the lungs. less stressed without dedicating hours of your time. What are your favorite yoga poses to do anywhere, any time? Share them with us in the comments below!